What’s the best font for email? You are here: Home / Online communications / Email / What’s the best font for email? I received an email a few weeks ago from advertising specialist Darren Wiedman, who subscribes to my e-zine. Thank you, Darren. I’m sorry. We’re going to do better. Darren, whose job includes building HTML emails, suggested that we consider 14 point as a minimum for email text. He sent links to a post by Litmus and other email clients that agreed. That got us wondering: What are the best font styles and text sizes for easy-to-read emails? 1. What’s the best font size for email? Print copy is most effective at 10 to 12 points, wrote Colin Wheildon in his landmark 1995 book, Type & Layout. Wheildon drew fans like David Ogilvy and Milton Glaser for his proven-in-the-lab best practices. Online, participants read 12-point type faster than 10-point type, according to a 2002 study of three professors at Wichita State University’s Software Usability Research Lab. Participants also read 12-point type fastest in a 2006 study by the Buskerud University College Optometry and Visual Sciences department in Norway. When researchers reduced that type to 8 points, readers saw a 10% drag in reading time. The big change since those studies? Mobile reading. More than half of your audience members now open your emails on their smartphones, not their laptops. Body text: 16 pixels for longer emails to 22 pixels for shorter ones. Apple recommends 17 to 22; Google, 18-22. Line height: 1.4 to 1.5 pixels. This saves your message from looking as if the letters are too close from one line to the next. Calls to action, buttons, other touch targets: 46 pixels square. Apple recommends 44 pixels square; Google, 48. Bottom line: Choose a font size that’s big enough so readers don’t have to squint or zoom, small enough so it doesn’t waste precious screen space. 2. What’s the best font for email? Which typeface works best online? Online, people read messages set in Times New Roman and Arial fastest, according to a 2002 study by three professors at Wichita State University’s Software Usability Research Lab. Arial and Courier were the most legible; Comic Sans the least, according to the Wichita State study. 3. Is serif or sans serif the best font for email? What’s the difference between serif and sans serif fonts? In print, serif text type is easier to read. That’s because the serifs help define the letters, which speeds reading. Online, sans serif text type is easier to read. That’s because the serifs pixelate, fuzzing up the letters a bit. Bottom line: Choose a sans serif font for email body copy, a serif font for headlines and other display copy. Avoid italics. They don’t pixelate properly, making them hard to read online. Don’t underline text. Visitors will mistake it for a link. Choose black type. That light gray default font your email template came with? Costing you readers. Use blue for links, purple for clicked links. Web visitors have learned these conventions on other sites; don’t make them learn new rules for yours. Use web-safe fonts, including any custom fonts. Thank you, Darren, for starting this discussion. Do you still need your glasses? Assuming your audience members do open your message, people spend an average of just 11.1 seconds on each email they review. That’s enough time to read about 37 words. Would you like to learn to beat those odds to get your message read? 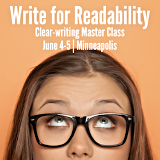 If so, please join me at Reach Readers Online — our three-day digital-writing workshop on July 24-26 in Portland. In this email-, blog- and web-writing workshop, you’ll learn to make the most of your e-zines, newsletters and blast emails. Interesting that Baskerville is “most persuasive,” yet, as a serif font, is harder to read online? I also noticed that many of the recommendations are measured in pixels – and the mailchimp article specifically mentions 320px and 480px screen widths – but those are very dated. See http://gs.statcounter.com/screen-resolution-stats/mobile/worldwide for some stats on today’s larger screen dimensions. The size of font may somewhat depend on the age of the reader. We publish e-newsletters that go to farmers, and the average age of U.S. farmers is just over 58. In other words, people who don’t see as well as they did 20 years ago. Thank you, Owen! Agreed! My 60-year-old eyes don’t see as well as they did 10 years ago. Screen reading itself has caused a lot of vision problems. I use 12 or 14 point Georgia for everything. I’m a 14-point Arial gal myself! Love this Ann. Thank you for a very useful post! Why is the writing process important? What is a good readability score?